Some of our critics have been quick to contend that our modern temples and practices have no relationship whatever to the temples of ancient Israel. This is a quick judgment indeed. If one is willing to open their eyes that they may hear, and their ears that they may see, then many marvelous understandings of God’s purposes may be unfolded to their view (D&C 136:32; 3 Nephi 11:5; Isa. 35:5; 1 Ne. 10:19; Mosiah 2:9; D&C 6:7; D&C 11:7). 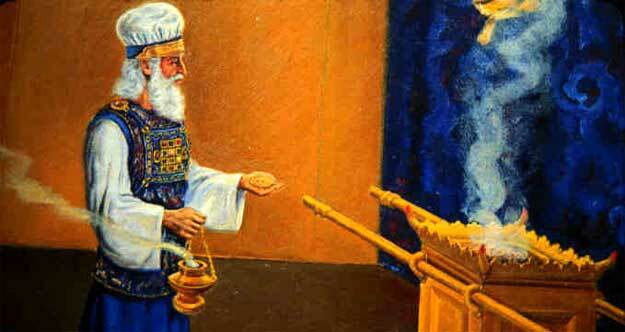 One of the vessels that was placed inside the ancient Israelite tabernacle, and later in the temples of Solomon (First Temple) and Zerubbabel (Second Temple), was the altar of incense. The structure of the altar was similar to the ark of the covenant, with four horns at the corners, and golden rings on the four corners so the altar could be moved from place to place. When placed in the tabernacle or temple it was placed directly before the veil which separated the holy place from the holy of holies where the divine presence and the Ark of the Covenant stood (Ex. 30:6). Brown continues to note that the type of incense used on the altar was also symbolic, making this sacred space a “fragrant and purified atmosphere similar to that enjoyed by Jehovah in heaven”2. In other words, incense burning would make the holy place welcome for Jehovah to visit and make his divine presence known. Certainly such prayers were offered around the altar of incense, and before the veil in the holy place, further reinforcing the symbolism between incense and prayer. The offering of incense had to take place after the sacrifice, because only after the atonement could communion with God take place. After the offering of incense, the Kohenim (priests) pronounced the Priestly Blessing upon the people. The incense itself has many interesting connections with different religious practices and beliefs, which we will examine in a future post, but one note is that it is a “common motif . . . as a form of sacrificial offering to a deity”3. Regarding the next to last paragraph (Wikipedia quote), see Numbers 6:22–27 and its literal fulfillment in 3 Nephi 19:25–30, esp. 25 and 30. Also, it is thought that Luke 24:50 was Christ’s giving the Aaronic High Priestly blessing. Also, see Leviticus 21:9–12, esp. 10 and the footnote to verse 10. Very interesting observations. There is much more to the scriptures than at first glance. Thank you for pointing out these connections. I particularly like the footnote to Leviticus 21:10 – having one’s hand filled (the literal Hebrew words here) has the same meaning as being authorized, equipped or consecrated. Very insightful. What wonderful observations you have made. Most certainly the worship in the Old Testament corresponds directly with the worship we do today in our latter day temples. I would like to add a few more points that we may ponder…On the actual altar of incense were four horns, or four symbols of power (or priesthood). Isn’t it interesting the placement of that altar is precisely before one could enter into the presence through the veil. As the officiator or “High Priest of the Aaronic Priesthood” holds the golden censor in his hand, are we not requesting a mediator to guide us into God’s presence? I see a complete forerunner of the ceremony we have today. It is so cool. The horns of the altar of incense did receive the symbolism of the sacrifice of atonement, connected to IntheDoghouse’s comment that the horns symbolize power/priesthood. During a time of national emergency (because of iniquity) Moses commanded Aaron to “Take a censer, and put fire therein from off the altar, and put on incense, and go quickly unto the congregation, and make an atonement for them: for there is wrath gone out from the Lord; the plague is begun.” (Numb 16: 46) “And Aaron took as Moses commanded, and ran into the midst of the congregation; and, behold, the plague was begun among the people: and he put on incense, and made an atonement for the people. And he stood between the dead and the living; and the plague was stayed.” (Numb 16:47-48). I don’t know if a sin offering was made before the people, and then the censer utilized, or if it was sufficient that the censer carried with it the symbolism of atonement that the incense altar received from the altar of sacrifice. Either way, the censer of incense was involved in the representation of the atonement and the priest’s pleading for that atonement to be applied; perhaps a prayer similar to Numb 6:26 as Kathy mentioned, “The Lord . . . give thee peace” i.e. wholeness or integrity. The people were made whole through the atonement; the priest stood between the dead and living as the Messiah has power to do through the atonement. Fascinating insights! Thank you! It would be interesting to learn more about the horns on the corners of the altar of incense. The Psalms reference (“and the lifting up of my hands as the evening sacrifice”) got me wondering whether there is a connection with the raising of hands often seen in evangelical services. Is there a historical precedence for this practice among modern Christians? Yes there is. See my post on the Early Christian Orant Gesture in Prayer.